Yes, it's true. You better act fast before I'm Invincible...Just kidding. 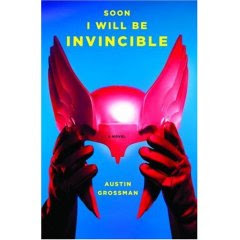 Actually I want to tell you about a cool book I just finished, called Soon I Will Be Invincible. It's written by a first time author who is a grad student at CAL right now and it's a total spoof, satire, whatever you want to call it on the Comic Book and Super Hero worlds. Imagine a book about the Fantastic 4, except one of the 4 has a PR agent, another has a cosmetic line, and yet another is a spokesman for General Electric. It's a funny, wacky book and a quick read. Where did I find such a great book? Well Rakestraw Books, in Danville of course. Nicest place and the guy behind the counter recommended it to me. I'm not giving Soon I Will Be Invincible, "Best Book Ever" status but it's a good entertaining read that is easy on the brain. Why Don't People Care About This? Free Crowdsourcing Idea for Target, Inc.